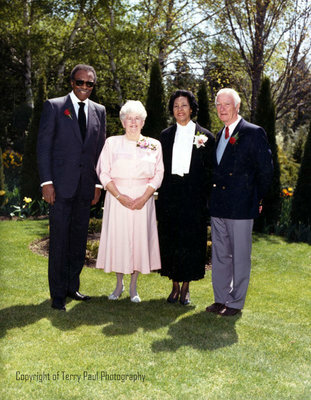 A colour photograph of the Honourable Lincoln Alexander, Lieutenant Governor of Ontario, Connie Cullen, Her Honour Yvonne Alexander and Len Cullen at the grand opening of the Cullen Gardens Restaurant and Tower on May 2, 1987. Opening of Cullen Gardens Restaurant, May 2, 1987, Terry Paul Photography. Whitby Archives A2013_042_014.